Our partners have challenges for you, do you have solutions? Join us in Berlin to bring Ideas to reality. As tapio we help the wood industry to jump into the digital world. Help us to realize this vision by tackling five real-world challenges provided by our partners. Our business partners are machine, tool, and material manufacturers. By using the tapio technology platform, our partners offer services and digital solutions to their customers. 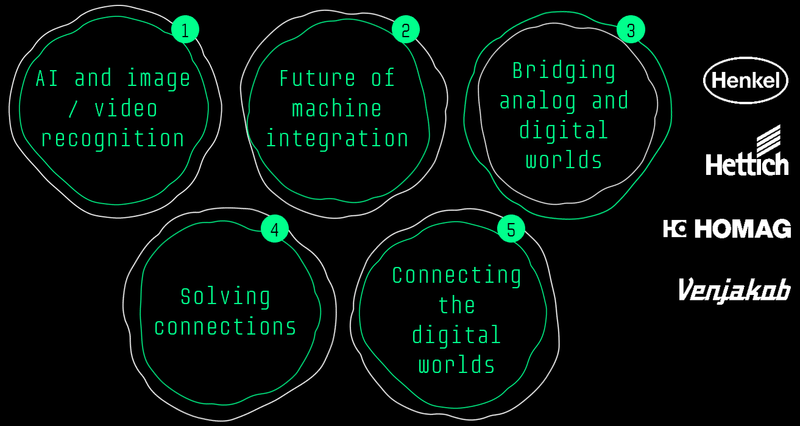 With the tapio Hackathon Hack the wood 2019 we strive to find new exciting ideas for five challenges. Four of our business partners shaped these challenges. Therefore you have the chance solve real-world problems. The event will take place in Microsoft's Cloud Studio Berlin. During this time you have the opportunity to work with our partners, tapio and experts on solving the challenges. On May 28th is your big day, pitching your solution in front of an expert jury. You will present your result during the LIGNA world exhibition in Hannover. LIGNA is the most significant exhibition for the wood industry with > 90.000 visitors in one week. This stage provides a vibrant location to showcase your ideas to companies who care about solutions. All participants will be invited to the finals in Hannover and can join the party on "treasure island"
Interested in joining and participating? If you are keen on AI and image/video recognition, this is the challenge for you. You will get example materials from our sponsoring partner. Based on this your challenge is to find ways to derive answers. Physical machines in the wood industry are complex assets, with a plentitude of functionality. Take the challenges and try to find new ways for how a worker could interact with a machine. Everybody talks about the digital world. Nevertheless, many areas of our reality are still analog. How could they become digital? If you can't connect something, can it be digital? Take this challenge and find solutions. Our world currently has thousands of older machines. Your challenge is now to find ways to connect them and make them smarter. A real machine will be on site to provide you with plenty of possibilities to try out your ideas. No one is alone even in a digital world connection is still the foundation we all need. This challenge will dive into the topic of how multiple currently independent digital environments could be connected.